Perfectly ripe Teena's Pride heiroom tomato wedges, big spoonful of creamy cool burrata in the middle, sprinkled with a confetti of basil, drizzled with a wild Spanish olive oil, very light sprinkling of the Rustichella 6 balsamic just over the tomatoes, and Fleur de sel. 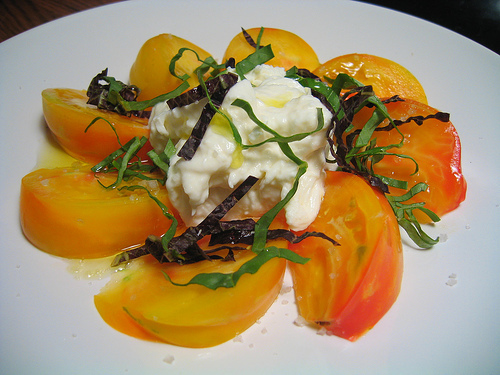 Burrata is a fresh Italian cheese, made from mozzarella and cream. Fleur de sel is a hand-harvested sea salt. 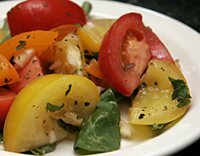 The red, yellow, and orange tomatoes make this stunning salad extra flavorful and beautiful. Cut cores from the tomatoes; slice each tomato into 8 to 10 wedges. Combine with remaining ingredients in a large bowl; toss to blend well. Cover and refrigerate for at least 1 hour before serving. Serve on salad greens, if desired. In a food processor or a blender, combine 3 cups of the tomatoes, the lemon juice, half of the corn kernels, and half of the onion and pure. Taste for seasoning. Transfer to a large bowl and cover. Refrigerate until well chilled, at least 1 hour and up to 3 hours. Stir again before serving. Taste for seasoning. Serve in chilled shallow soup bowls, garnished with the remaining tomatoes, corn, and onion, the cucumber, and the fresh cilantro leaves. In a bowl, combine the tomatoes, onion, garlic, olive oil, lemon juice, basil, tarragon, salt, and pepper. Add the croutons and toss well. Divide tomato mixture among 4 plates. Top each serving with an equal amount of the arugula. With a vegetable peeler, shave the Parmesan over the salad. Serve immediately. Put all ingredients into the blender, and blend a full minute until mixture is creamy. Pour into a narrow neck bottle and shake well before serving. Refrigerate leftovers. Keeps about 5 days. Makes 3 1/2 cups (840 ml). Stir together shallot, garlic, vinegars and sea salt and let stand 20 minutes. Add 1/2 tsp of ground pepper, then add oil in a slow stream, whisking. Toss salad with just enough dressing to coat. Serve immediately.